I know, it's almost Thanksgiving... that's just how far I am running behind... on everything right now. Anywho, let's rewind a few weeks so I can talk about Halloween! 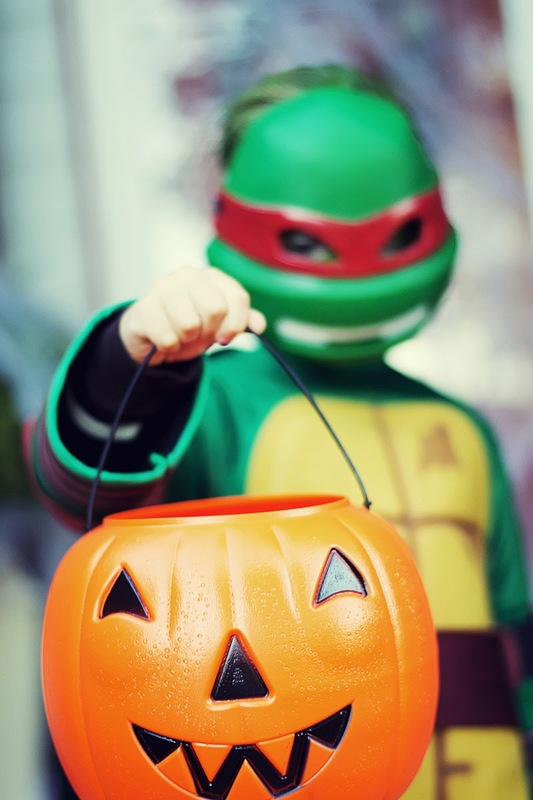 Because I love doing Halloween with our son, we always have so much fun and I enjoy eating all his hard earned candy afterwards. Last year, I reviewed all the costumes we've done so far, I was hoping to have time to do that a little bit this year, but the speed bump just doesn't allow me much time. So I'll just do a quick summary before jumping into this years costume. - His first Halloween was in 2010, he was an adorable little dinosaur, I did not make his costume this year. I actually hadn't even considered making a costume at this point. - In 2011 he was Batman, because, I'm his mother and I put things together so I get to pick Batman over Superman. My husband is a Superman fan and I'm a Batman fan and the poor kiddo is just stuck in the middle. I sorta made this one, I put him in black sweats and a Batman tee, then made the cape and mask. He was almost two, it was cheap and worked! - In 2012, we had Doctor Who, Matt Smith's 11th Doctor. My favorite is Tennant, but he was only familiar with Smith and he got to wear a Fez [And a bowtie!]. He looked great as the Doctor, he even has a Matt Smithish look. I didn't really "make" this costume, I just bought bits and pieces to make the look. - In 2013, he was my favorite so far, Link from the Legend of Zelda [Not to confused with Zelda, the princess]. I'm a long time nintendo geek, pretty sure I was "playing" nintendo before I could stand. I actually made this costume from scratch, aside from a couple of obvious things like his pants. I drew most of my inspiration from the Skyward Sword Link, while picking out parts I loved from other Links. My son loved this one and even asked if he could wear it again, sadly he outgrew it already, sniff. And that brings us to the current year, 2014! I actually had plans to make a Wolverine costume this year, classic Logan in yellow. I had it planned, I had been working on drafts when, well, the fatigue and nausea started up. I lost most of my desire to do anything, but of course, I was going to power through for my kid. And then he threw a wrench into my plans. I am a crafty mom, I love making things and really looked forward to making his costume. But the truth is, the costumes and all the fun we make out of Halloween, we do for him. 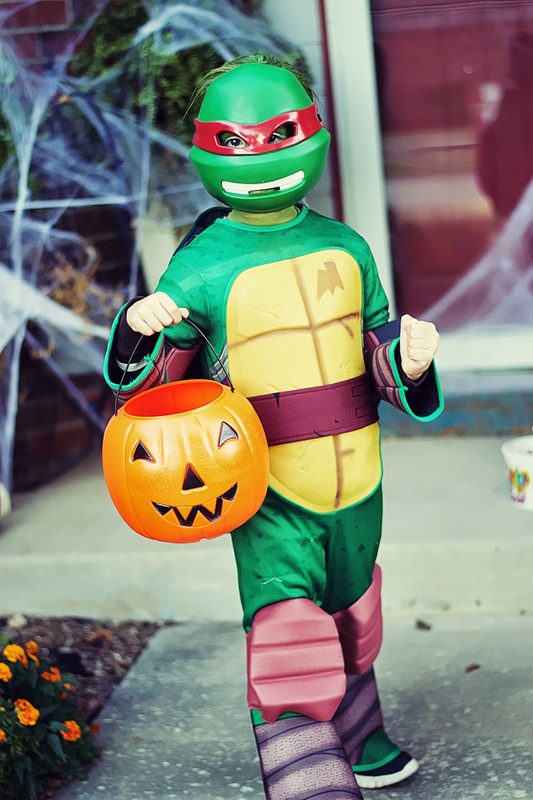 So when he came running in one day to ask if he could trick or treat as a Ninja Turtle, I immediately said yes. Sure, I was a little disappointed but again, it's about him having fun! I did spend a week searching for ways to make an awesome costume. But as I began sifting through and saving works from cosplayers [Yea, I can't just look at what a normal person would do, I had to search the professionals! ], it just began to look like more work than I had the energy for. And let's be honest, kids like the cheesy store bought costumes I loath. So I swallowed my pride and just bought the costume. Done. And then I probably took a nap. I did have to do ONE thing to make myself feel better, ha, I bought green face paint and green hair paint so he would at least be all GREEN. If you pop back up to the top image, you can see his face is all green and I outlined his eyes in white. I also had plans to at least take him downtown and take photos in the city, you know, where a Ninja Turtle lives and it just never happened. I was sick all the time, could hardly eat and hardly had energy. So I took a few photos prior to starting trick or treating and guess what, life went on! Despite not getting to make a costume or do my photoshoot, everything went on just fine. The kiddo had fun, he got candy and he was HAPPY. 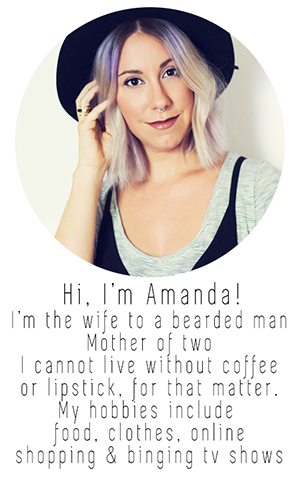 Okay, I'm lying just a little. He was not happy about taking photos directly before trick or treating, but I knew it was my only chance! The good news for me? He talked about wanting to do something more original next year. Like a Zombie or Vampire... I know that's not "original" but he wants to break away from being a specific character and I love the way he thinks. Trust me, I'm plotting. You can't just be a zombie! Maybe you're Zombie Mozart or a Zombie Cowboy!? Here's his best "Ninja Pose"... it says, "Please hurry up and take your photo so I can go!" Oh and I forgot to mention he was Raphael, if you're a turtle fan you knew that but just in case! 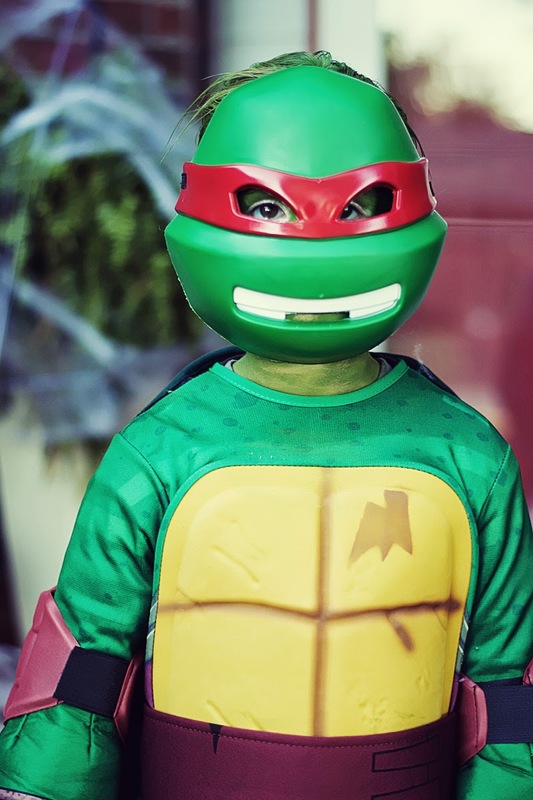 He chose the Turtle, I thought he'd want to be Donnie or Mikey, but he chose Raph. I even triple checked with him before hitting the order button. 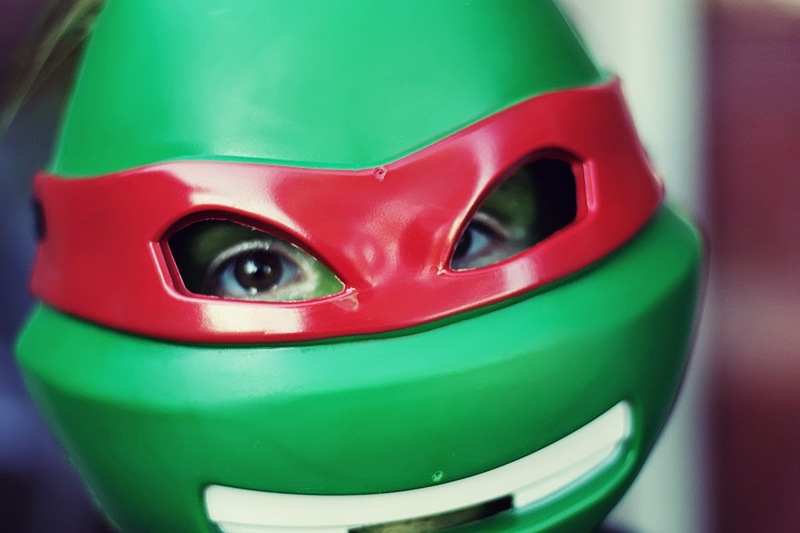 Raphael is my favorite turtle, this kid is more like me everyday. Must be scary for my Husband.